messing about with perspective and the edit feature on Vista, I transformed a very innocent emote into something far more sinister ..
**Ala's concept began almost a decade before her current GuildWars incarnation; the original "Alacrity" was a character I played for years in Bethesda's fantasy rpg Elder Scrolls II: Daggerfall game ~ she was a Khajiit (scorned race of catpeople) assassin/magician whose custom class I named "Deathpixie". She mostly used a bow and magic, and finished off surviving prey in unarmed combat. That world's freeform possibilities were best for characterisation ~ Alacrity totally ignored the main quest, it held no interest for her, and preferred to raise her standing in the assassin's Brotherhood and wreak havoc in her own style. I basically reserved the name "Alacrity" anytime I felt like playing a cute deadly female assassin - not necessarily in a fantasy setting; her persona was not really developed beyond being a naive outsider, and someone who did not follow what was expected. There are many games I enjoyed where she DIDN'T appear; for example I forgot what I named my assassin in Diablo II (not my fave class there anyway), but that game felt too linear and the toons lacking in identity for me to get connected to any characters. Same for the KOTOR and NWN series, although I really enjoyed those, for some reason I did not identify with the characters (and again, maybe because I preferred other character types there). 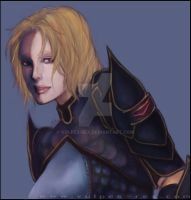 Nor did I recreate her in the subsequent Elder Scrolls series (Morrowind and Oblivion), just didn't have the right feel. the next time Alacrity made a significant appearance was in SirTech's strategy rpg Jagged Alliance 2 - yes, as a modern day mercenary. Again, a setting where the main goal can be totally ignored and the player can romp about the violent countryside doing as they please. Assassination and stealth could be quite important, and it was more fun to be a maverick, so she seemed to belong here. Of course I had to recreate her for each campaign (SirTech released only one addon, but fans created several more), and spent many years enjoying her antics there. This time she became a redhead simply because the sole female blonde avatar was not cute enough; even after I learned how to change pictures etc, Alacrity remained a redhead (but an even cuter one). I also used the russian voicemod, so she spoke in russian ~ no I do not understand a word, but it kept her in character as an outsider (and the stock american voices got kinda annoying after a while). No, Alacrity did not appear in SirTech's fantasy rpg Wizardy 8, even though faerie assassins are quite potent there .. again that world is too linear and the characters seem to lack uniqueness. I was then introduced to MMORG's by friends, they play pay-per-monthlies like Ultima, WoW, EQ and others I can't remember. I resisted joining, mostly cos whenever I watched over their shoulders, I saw a lot of grind .. I decided on the no-fee Guild Wars; and because in mmorgs there's interaction with hundreds of people a week, I felt the need to make a proper full story for Alacrity, plus the GW universe is rich enough to use as the setting. She looks like a Mortal Kombat ninja. Looks pretty cool. Too bad about wizardry 8, but the company died in the middle of development. oh~! I'm amazed when anyone finds my scraps, I myself forget what I put here sometimes~! ya, too bad about lots of quality games - just as well tho, I've had almost no time for them this last year~! thanks, I could do better with the cropping, I initially wanted the centre to be where her eyes focus, cos the eyes what I tend to look at first, but I can see this would be better shifted to the left a bit. we should hang out ingame sometime. do some some together art. you know. my assassin looks simular. plus i looking for a muse so i can start doing artistic pics as well. well if you do my ingame name is "myth Alchemist" just whisper me k? sounds cool, Ala's long past the point of obtaining all the clothes, titles and items she wants, so grind is a thing of the past .. she's not rich mind, having given away most of her plat, and will prolly never have a piece of FoW, but her modest GW needs are all met.